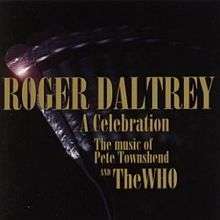 A Celebration: The Music of Pete Townshend and The Who, also known as Daltrey Sings Townshend, is a music event and later album documenting a two-night concert at Carnegie Hall in 1994. It broke Carnegie Hall's two-day box office gross record, and was the fastest sell-out in the historic venue's history. The concert also raised money for Columbia Presbyterian Babies Hospital. 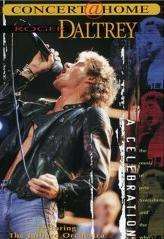 This event was produced by Richard Flanzer and Roger Daltrey of English rock band The Who in celebration of Daltrey's fiftieth birthday. The Who's music was arranged for orchestra by Michael Kamen, who directed The Juilliard Orchestra for the event. Pete Townshend, John Entwistle, Eddie Vedder, Sinéad O'Connor, Lou Reed, David Sanborn, Alice Cooper, Linda Perry, The Chieftains and others performed as special guests. The event was followed by a major tour of the same name and including John Entwistle on bass, Zak Starkey on drums and Simon Townshend on guitar. Although the tour was considered an artistic success, it didn't earn enough profit in several cities to cover high expenses, so it was concluded early. However, it did serve the purpose of attracting attention to songs from The Who's Quadrophenia, and gathered support for a staging and major tour of the rock opera in 1996-1997. In 1994 Daltrey's manager, Richard Flanzer, made a $450,000 deal to record and film the two nights of Carnegie Hall performances with Tim Brack (President of Continuum Records) with direction credited to Michael Lindsay-Hogg. The CD was released on Continuum 19402 USA. Edited by Alan Miller, a DVD was released 14 July 1998. The vocal contribution of Sinéad O'Connor on "Baba O'Riley" and "After The Fire" were edited from the CD, but included on the DVD. N.B. "Overture" is not The Who Song from Tommy, but a special medley for these concerts and subsequent tour, consisting of "A Little Is Enough," "Rough Boys," "Sparks," "Dr. Jimmy" ("Is It Me?" section), "Baba O'Riley," "Who Are You," "Quadrophenia" ("Helpless Dancer" theme) and "See Me, Feel Me,"
Linda Perry – Vocals on "Doctor Jimmy"
John Entwistle – Bass on "The Real Me"
The Chieftains – Bodhrán, Bones, Fiddle, Flute, Irish Harp, Oboe, Tin Whistle, Uilleann Pipes on "Baba O'Riley" and "After the Fire"
David Sanborn – Saxophone on "5.15"
Pete Townshend – Guitar, Vocals on "Who Are You"
1 2 "Roger Daltrey Discography".